Editor’s Note: Geneive Abdo is the director of the Iran program at The Century Foundation. Reza H. Akbari, the research associate for the program, contributed to this article. As Iran issued another threat on Tuesday, this time to take action if the U.S. Navy returns an aircraft carrier to the Persian Gulf, it might seem that the government in Tehran is begging for a military attack. 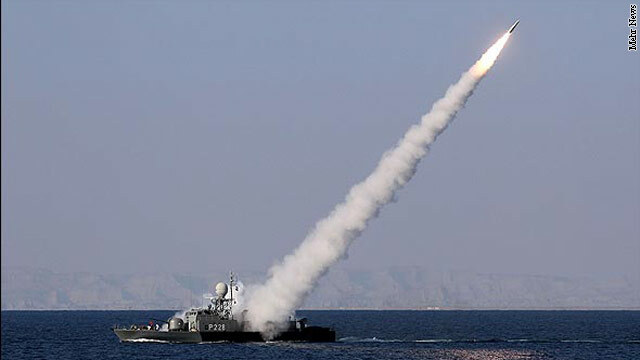 Why else would the Iranian regime test fire a cruise missile during exercises in the Persian Gulf on Monday? Why would it threaten to close the Strait of Hormuz two weeks ago while also conducting 10 days of military exercises to show off Iran’s military might? In addition, Iran’s nuclear agency said its scientists had produced their first nuclear rod, despite tough sanctions from the United States, the United Nations and the European Union. But Iran is not begging for a military confrontation. It’s recent aggression is due, in fact, to its fear of a pending military attack. My sources inside the country say the circle of regime insiders around Supreme Leader Ali Khamenei truly believes an attack is inevitable, perhaps even before the U.S. presidential election. Therefore, to save face at home and in the region, Iran’s saber-rattling has reached a fever pitch. In order not to appear weak in light of the pressure coming from the United States, Iran is determined to show it maintains the upper hand, which it tries to demonstrate through its military exercises, threats and hostile rhetoric. But such behavior, which Iran believes demonstrates its strength and some in the United States view as aggression, should not be misunderstood as Iran provoking the United States to launch a military attack. The more candidates running for election in the United States publicly endorse a military attack, and the more the Obama administration is forced to appear hawkish, the more the Iranian regime works to prepare for what insiders believe will be a hit on the country’s nuclear facilities if not the population. Despite the fact that the legitimacy of the Islamic Republic has depended upon an ideologically-driven foreign policy for more than thirty years – no normalized relationship with the United States and no recognition of the state of Israel – this in no way means Iran wants a military conflict. There is a difference in finding virtue in the distance between Iran and Western powers, as the regime has done since the Islamic revolution, and risking self-destruction. As much as American pundits and politicians highlight the hostile statements coming from Tehran, a closer examination reveals Iran’s backpedalling in recent days. Iran’s vice president appeared definitive when he threatened to close the Strait of Hormuz if further sanctions are imposed on Tehran. “If we cannot export oil, not a drop will be allowed to be exported by anyone else,” said Muhammad Reza Rahimi, Iran’s first assistant president. American policy makers and pundits should use their imagination to see the view from Tehran. Influential Americans sound the daily call for action to be taken against Iran, even though most fail to explicitly spell out the details. Compound this with a long-standing belief of Supreme Leader Khamenei that the United States’ objective has always been regime change in Iran. The small circle around Ahmadinejad and the Supreme Leader himself believe they are engaged in a new cold war, which has been hotter than that between the U.S. and the former Soviet Union, characterized by covert operations inside their country including the assassinations of nuclear scientists, a computer virus and attacks on Islamic Revolutionary Guards posts. These Iranians belief that this “soft war” is a prelude to real war on the horizon. Despite the failures of President Obama’s engagement policy with Iran during the early period of his administration, there was one important success, which is often forgotten: Obama managed to convince at least part of the Iranian people that the United States was not in conflict with them, but their government. This message found particular resonance with at least some young Iranians who want to become part of the globalized world. However, with the approval of the most recent sanctions on Iran’s central bank, it is likely Iran’s business class will blame Obama. They have witnessed a depreciation of 10 percent in their currency just in the last week. Now, Khamenei and his hard-line loyalists have just received the evidence to undo this delicate and newfound trust between Americans and Iranians. Both Khamenei and President Mahmoud Ahmadinejad in recent months have used the bellicose rhetoric from Washington to argue at home that the United States is at war with the Iranian people. This serves many useful purposes for the regime, including justifying repression against those who are accused of being “spies” for the United States who in reality are working toward positive change in Iran. But in the end, Iran wants to move away from the brink. Cooler heads in Washington should do their part to end the escalation of hostility before the regime’s perception becomes reality. The views expressed in this article are solely those of Geneive Abdo. LIKE I SAID BEFORE NEVER PUT THINKS OF TILL TOMORROW WHAT SHOULD BE DONE TODAY ?? THEY ARE ALL SNAKES AND WE BELIEVE THEM WAKE UP!!!!!!!!!!!!!!!!!!!!!!!!!!!!!!!!!!!!!!!!!!!!!!!!!!!!!!!!!!!!!!!!!!!!!!!!!!!!!!!!!!!!!!!!!!!!!!!!!!!!!!!!!!!!!!!!!!!!!!!!!!!!!!!!!!!!!!!!!!!!!!!!!!!!!!!!!!!!!!!!!!!!!!!!!!!!!!!!!!!!!!!!!!!!!!!!!!!!!!!!!!!!!!!!!!!!!!!!!!!!!!!!!!!!!!!!!!!!!!!!!!!!!!!!!!!!!!!!!!!!!!!!!!!!!!!!!!!!!!!!!!!!!!!!!!!!!!!!!!!!!!!!!!!!!!!!!!!!!!!!!!!!!!!!!!!!! !